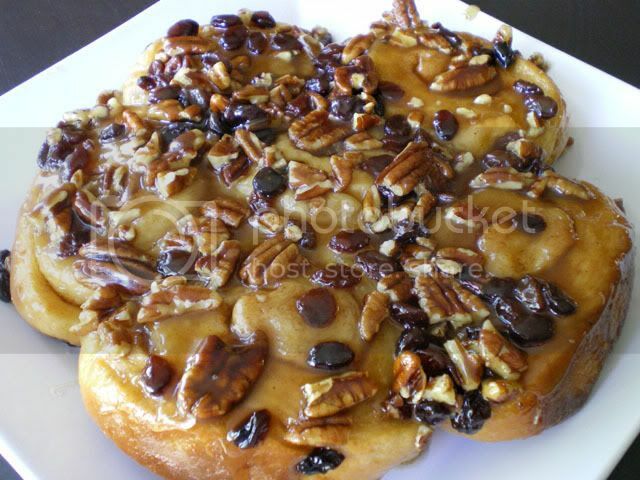 I was incredibly excited to see that this month's Daring Baker Challenge was going to be Cinnamon Rolls or Sticky Buns. 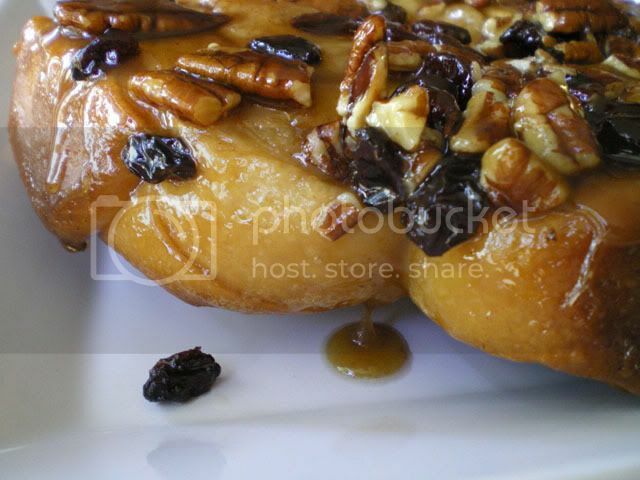 Sticky Buns are a huge favorite of mine, and something that I have never actually made at home before. The recipe turned out great, and everything went smoothly, with no hitches. There was a base recipe for the rolls and then everyone had a choice to make cinnamon rolls, sticky buns or a combination of both. I went with the sticky buns, and they were so good, I will probably go back at some point and try out the cinnamon buns too. Check out all the other Daring Baker posts (I guarantee LOTS of mouthwatering pictures), at the Daring Baker Blogroll. 1. Cream together the sugar, salt, and shortening or butter on medium-high speed in an electric mixer with a paddle attachment (or use a large metal spoon and mixing bowl and do it by hand). Whip in the egg and lemon extract/zest until smooth. Then add the flour, yeast, and milk. Mix on low speed (or stir by hand) until the dough forms a ball. Switch to the dough hook and increase the speed to medium, mixing for approximately 10 minutes (or knead by hand for 12 to 15 minutes), or until the dough is silky and supple, tacky but not sticky. You may have to add a little flour or water while mixing to achieve this texture. Lightly oil a large bowl and transfer the dough to the bowl, rolling it around to coat it with oil. Cover the bowl with plastic wrap. 3. Mist the counter with spray oil and transfer the dough to the counter. Roll out the dough with a rolling pin, lightly dusting the top with flour to keep it from sticking to the pin. Roll it into a rectangle about 2/3 inch thick and 14 inches wide. Don´t roll out the dough too thin, or the finished buns will be tough and chewy rather than soft and plump. 4. Sprinkle the cinnamon sugar over the surface of the dough and roll the dough up into a cigar-shaped log, creating a cinnamon-sugar spiral as you roll. With the seam side down, cut the dough into 8 to 12 pieces each about 1 3/4 inches thick. 5. In the bowl of an electric mixer, combine sugar, brown sugar, salt and butter. 6. Cream together for 2 minutes on high speed with the paddle attachment. Add corn syrup and 1 teaspoon lemon extract. Continue to cream for about 5 minutes, or until light and fluffy. 7. 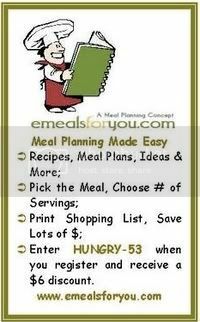 Coat the bottom of 1 or more baking dishes or baking pans with sides at least 1 1/2 inches high with a 1/4 inch layer of the caramel glaze. 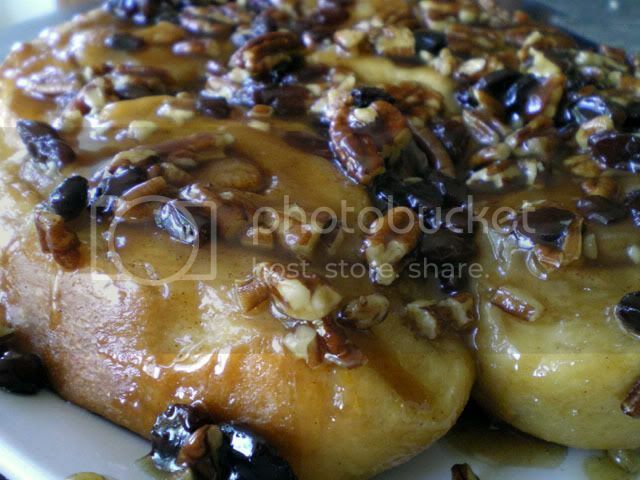 Sprinkle on the nuts and raisins Lay the pieces of dough on top of the caramel glaze, spacing them about 1/2 inch apart. Mist the dough with spray oil and cover loosely with plastic wrap or a food-grade plastic bag. 8. Proof at room temperature for 75 to 90 minutes, or until the pieces have grown into one another and have nearly doubled in size. 9. 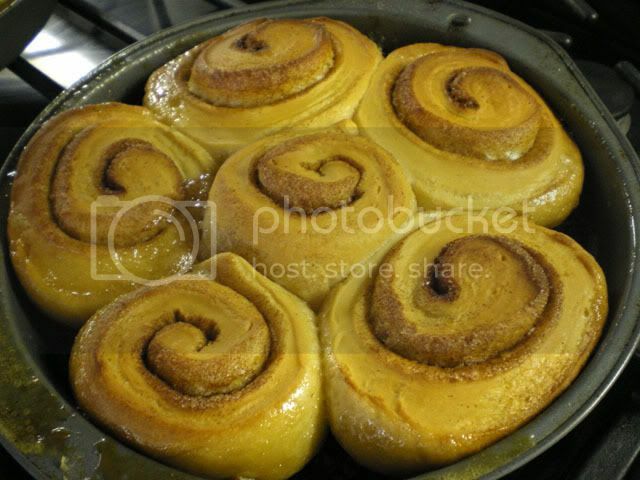 Preheat the oven to 350°F (175°C) with the oven rack in the middle shelf for cinnamon buns but on the lowest shelf for sticky buns. 10. Bake the sticky buns 30 to 40 minutes, or until golden brown.